Made famous by Tom Hanks and the movie ‘Cast Away’, Monuriki Island presents a fine example of an untouched tropical island. Before setting foot on this spectacular island or anchoring off its astoundingly white sandy beaches you are required to visit the village of Yanuya and present your sevusevu to the traditional landowners. After the sevusevu, you will be advised if it is an appropriate time to visit the island, and we ask that you respect the chief’s decision. If approved, you will receive a brief on the island’s biosecurity and its importance. The island is significant for a number of reasons. Firstly because one of the most endangered vegetation types: Tropical Dry Forest Vegetation occurs on the island. Subsequently the National Trust of Fiji and BirdLife Fiji launched a goat removal and rat eradication program. These introduced species are a threat to the native wildlife of the island, and their removal allows seedlings to grow and the rare Tropical Dry Forest to flourish once again. There is also a genetically unique population of the Fijian Crested Iguana that call the island home. Wedge-tail Shearwaters (Puffinus pacificus) are native sea birds that return to the island to breed between the months of October and April. Monuriki has among the largest and most important breeding colonies in the South Pacific region. Turtles also nest on Monuriki Island, so please do take care when walking along the sandy beaches, and if you spot any nesting turtles or hatchlings, be sure to record your sighting and submit this important information. The landowners have traditionally established Monuriki Island as a reserve for its significant wildlife and the surrounding marine environment. Before you land on Monuriki, check everything you will take ashore for stowaway seeds, lizards, rodents and ants. Please help us to protect our islands and obey signs and any information provided to you by the people of Yanuya Village. Restrict your movements to the beach you land on. If you are interested in learning more about the Crested and Banded Iguana, a small number of animals have been taken into captivity by the National Trust’s partner organization the ‘Kula Eco Park’ (just outside Sigakoka) as part of the captive breeding program. 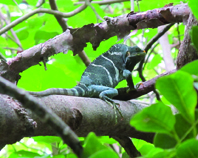 The program aims to re-populate both Yadua Taba and Monuriki islands and other locations the iguanas inhabit, with their respective species by giving Mother Nature a helping hand.